By Sean Charlesworth on Sept. 23, 2014 at 8 a.m.
I’ve been to every NYC Maker Faire and it keeps getting bigger. Since Will and Norm were unable to make it this year, I wanted to share with you some of the projects and cool stuff I saw. Hey everyone, Sean here with a World Maker Faire New York recap! 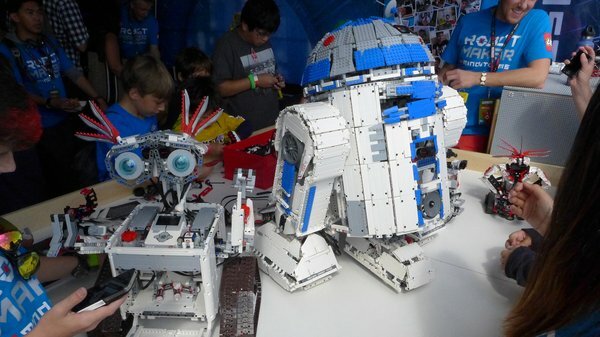 I’ve been to every NYC Maker Faire and it keeps getting bigger. I’ve had a booth the last two years but was too busy to get one together this time. The upside was I actually got to see the convention and all the new 3D printers and accessories that were either just announced or being shown in person for the first time. Since Will and Norm were unable to make it this year, I wanted to share with you some of the projects and cool stuff I saw. Within seconds of setting foot in the 3D Printing Village (one of World Maker Faire’s biggest draws) I ran into Anthony Campusano, a fellow maker who I’ve met numerous times and builder of an amazing Lament Configuration box from Hellraiser. The fellow with him enthusiastically exclaimed, “I follow you on Twitter!” and it turns out to be Andreas Ekberg, who made the Tested Cruiser skateboard! I didn’t realize it until later but Andreas is also responsible for the Classic LEGO Spaceman print that has been on my to-buy list. 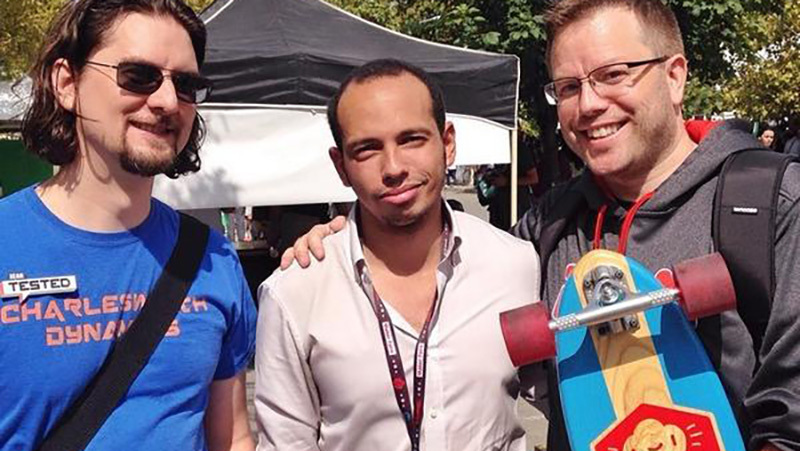 I had a great time hanging out with my fellow makers. Now let’s take a look at some of the good stuff I saw. 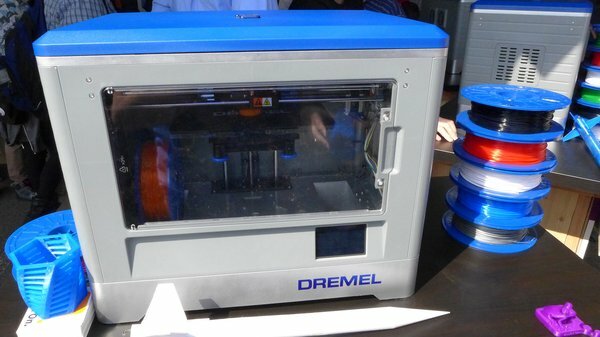 Dremel recently announced their 3D printer which I think is going to be a pretty big deal when it’s released in November. Design-wise, it’s similar to the MakerBot Replicator 2 which is good news since that printer has since been discontinued. Dremel's printer is designed for printing PLA with a non-heated print bed and active cooling fan. It’s completely enclosed for safety with a magnetic front door and a top the lifts right off--if I owned the machine I would remove both. The custom-sized .8 Kg spools sit inside the machine, which mean other manufacturers spools won’t work but you could easily mount it outside the machine. The printer has a 3-point manual leveling system with large, easy to turn knobs and a removable polycarbonate bed to make print removal easy. 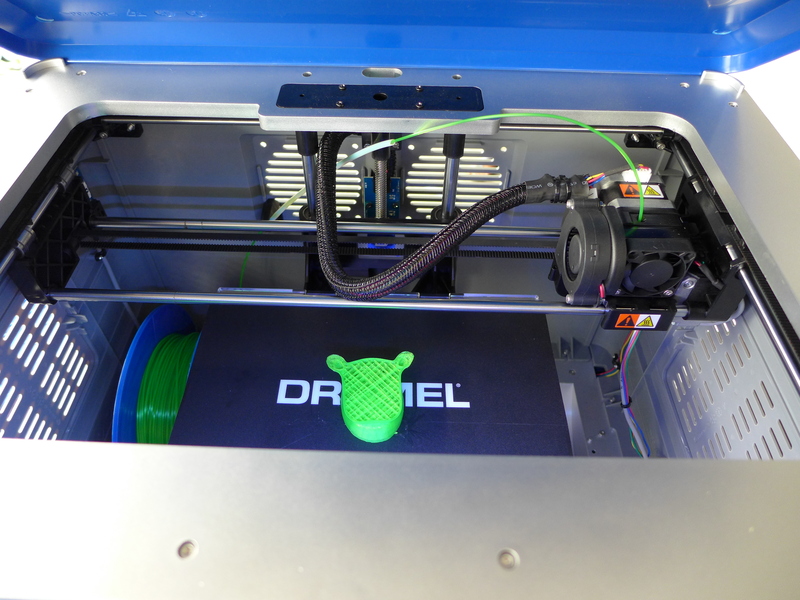 Dremel is using BuildTak (see below) on the print bed for improved print adhesion. They are using a spring-loaded extruder feed mechanism which has become the preferred setup for most of us. I like that they chose a pretty standard setup that can be disassembled. Since extruder clogs are going to happen no matter what, I asked them if they would cover extruder disassembly in the manual. They said ‘no’ but they would walk customers through it via a support line. Print quality looked good but they weren’t demonstrating the software, so I didn’t get into that. Finally, Dremel's printer uses USB or SD card for model upload and has a decent size touchscreen interface for control. I predict this will be a hot machine as it’s from a trusted brand with wide reach and has a nice price point at $999. Spools run $30 for .8 Kg which put them at about the average price-point for PLA filament. Since this is Dremel, I asked if this meant we would be seeing a desktop CNC machine soon and they just grinned. Although I have never owned one, I have always liked Netherlands-based Ultimaker machines and the Ultimaker 2 is really pretty. Ultimaker has always produced really nice prints and unlike MakerBot they still embrace their roots and offer the original Ultimaker as a kit. The 2 model comes fully assembled and can print ABS or PLA using 3mm filament. The 2 has a heated glass print bed for ABS printing, although the unit is not fully enclosed so I’m curious as to how large ABS prints will turn out. It still uses a bowden extruder, which means the filament is pushed through the feed tube by a mechanism on the back of the machine. This allows them to keep the actual extruder head very small and light which causes less momentum problems while printing at high speed. 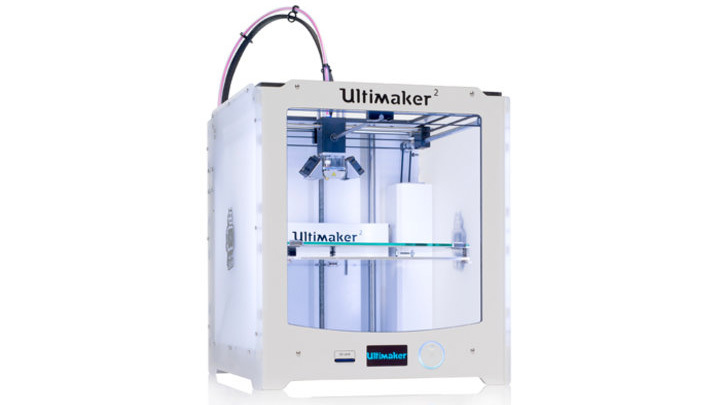 The Ultimaker 2 runs around $2500 and is a great looking machine from and established 3D printing company. As a bonus, Ultimaker had Valcrow’s work on display and I was extremely disappointed to find out he had been hanging out at the booth and I missed him! As I mentioned before, you can download and print his lightsaber and Ducati motorcycle models. 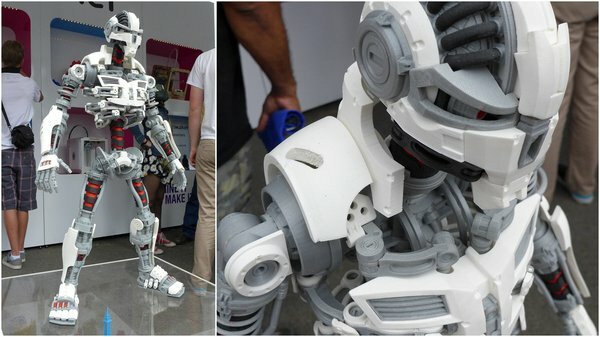 They also had something I had not seen before, Aaron Thomas’ impressive Ronin mecha that was completely printed on an Ultimaker. This guy was at least 18” tall and had an incredible amount of parts and detail. 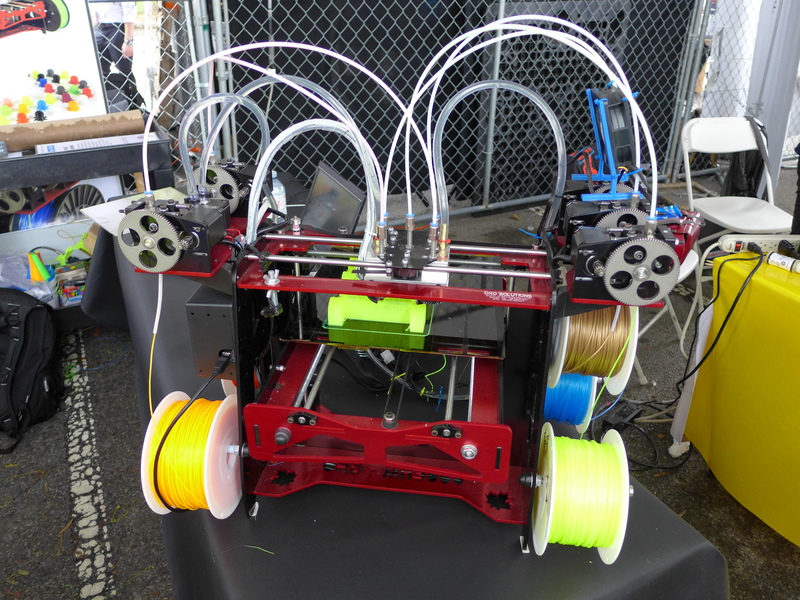 ORD Solutions from Canada had probably the craziest 3D printer that I saw at the Faire. They already had a successful Kickstarter for the RoVa3D 5-head printer. Yes, that’s right, five heads with liquid-cooling to prevent jams--this thing was impressive to look at. Construction quality looked top-notch, although you don’t want any small children around this thing with open print bed and stainless steel gears. It has a heated printbed, but once again, a fully open-air design can make printing ABS challenging. Print quality was very good and the five-color examples didn’t seem to have too much bleed/boogers between the colors. At $2500, the price is hard to beat if it delivers on quality and tech support. Paste printer with plaster prints. 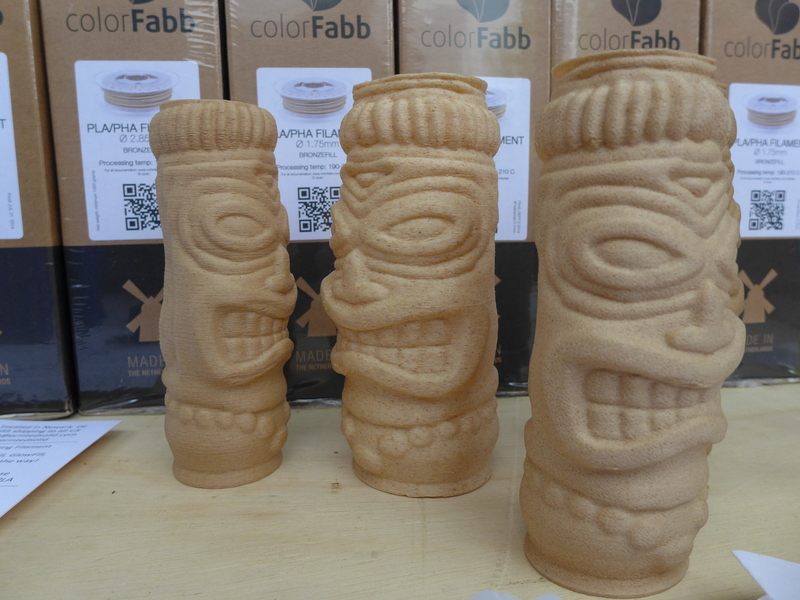 Even cooler was their current Kickstarter for a paste machine which is retrofitted to print with anything from plaster to peanut butter! In a field overrun with Kickstarter machines ORD looks to be making unique machines with some quality construction. 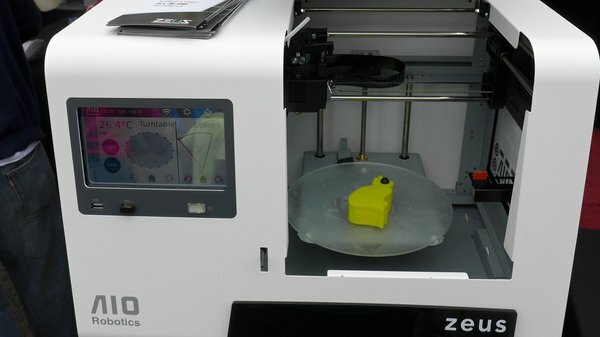 I unfortunately did not get to speak with the rep for Zeus printer which was successfully funded on Kickstarter, but it looks like a doozy. For $2500, It offers up scanning, slicing, printing and ‘faxing’ (that’s right) all in one unit. Construction didn’t look bad, print quality looked on par with other printers but I don’t know what objects I was seeing were scanned by the Zeus. I’m wary of this much packed into one unit for this price-point and look forward to hearing some real reviews. BuildTak is a thin, textured plastic (reminds me of thin kitchen cutting mats) with adhesive on the back that you stick to your print bed instead of using painter’s tape, kapton or glue sticks. They have custom sizes for most popular printers or you can cut it yourself. Both Dremel (see above) and Afinia are using it for their printbeds and for only $10 I decided to give it a try and will report back later. The finish samples they had on hand weren’t smooth like when using kapton, but they were also nicer than painter’s tape and it seems to work with just about any filament. It’s heavy enough that it seems tough to damage and cheap enough to replace if you do. You can not use acetone to clean it like I do for kapton, but alcohol is ok. Since it behaves differently than other surfaces, you probably need to set the nozzle to printbed gap differently than normal. I was not familiar with Printed Solid before this Maker Faire, but they are offering up unique printer supplies and services. They are carrying Netherlands-based colorFabb filaments which have gorgeous PLA colors as well as some really exotic stuff such as wood and metal impregnated filaments. They have recently introduced XT filament, a copolyester that has low odor, is FDA compliant, prints like PLA but is tough like ABS--this stuff looks really promising. Printed Solid hooked me up with some woodFill and I bought some bronzeFill and will report back later with results. 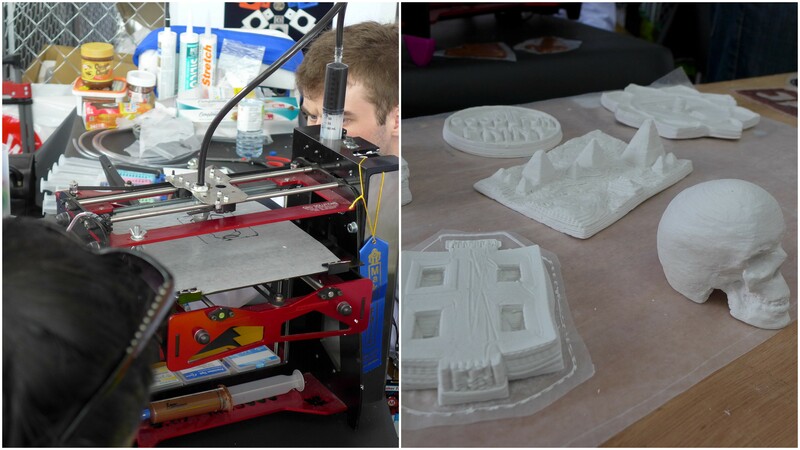 Printed Solid also offers services such as design and metal casting and silicon molding from 3D prints. I spoke with Quincy and Natalie of 3D Kitbash who are offering up digital downloads for printing on your own machine. They have the Boneheads series of skulls including mounting plaques, printer test kits for calibrating your printer and Quin, their fully articulated doll. The work on Quin was really well done and fully printable on a FFF machine. She has various add-ons and options available for download and they are working on themes for her as well. I like that they are offering downloads as an STL which gives you a lot more flexibility in printing versus sites that are offering models only formatted for a specific size and printer. 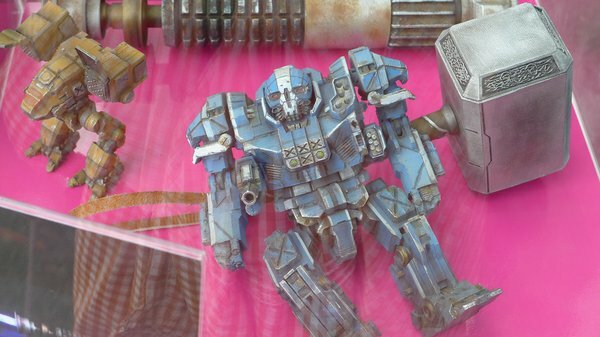 Modio’s stuff was very neat and where I can see toy manufacturers going. They make an iPad app that gives you a palette of modular pieces to building your own action figures and then print them at home. I really like the aesthetics of their parts which just snap together to make some cool figures. They really need to offer more than just an iPad app and get this on Android as well as a web app. UPDATE: Modio contacted me - they just released an iPhone app and are working on other platforms as well. CRP had some of the coolest 3D stuff I have ever seen. 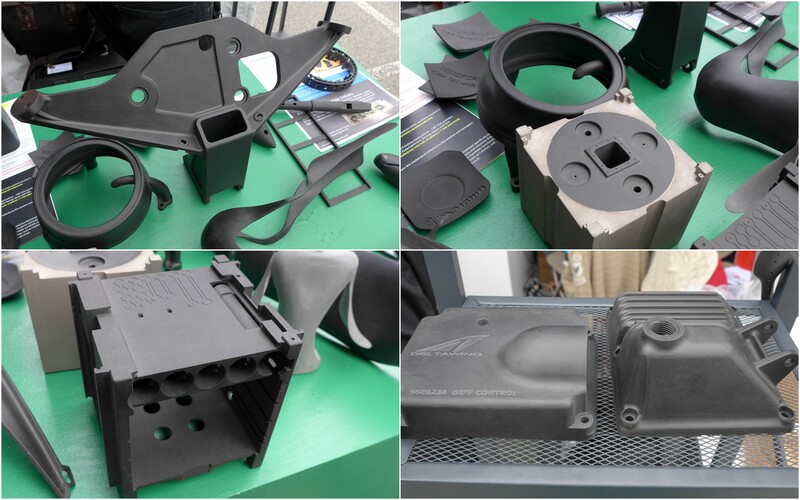 While their services are out of reach for us mere mortals, they came to Maker Faire to share what they do - making 3D printed carbon fiber parts for the likes of Formula 1 and NASCAR. They use modified 3D Systems SLS (Selective Laser Sintering) machines to print extremely light and strong parts for high-end applications. I was able to take one of their 3D printed carbon fiber parts that was dish-shape and pop it inside out and it popped right back into place with no problem - amazing stuff. I would be remiss to not mention that LEGO was there in full-force with a crew from Mindstorms and had these amazing bots with them. 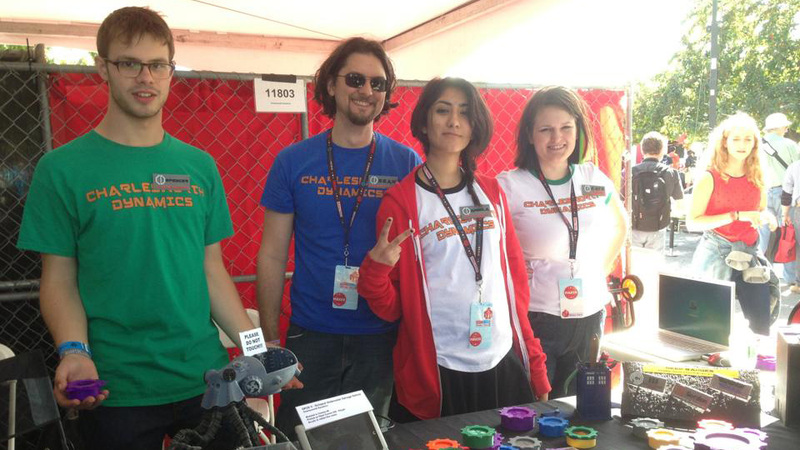 That about wraps it up for my experience at this year's World Maker Faire. It was a great time as always and I even got recognized as Adam's Inventern! Maybe next year I’ll see you guys there.